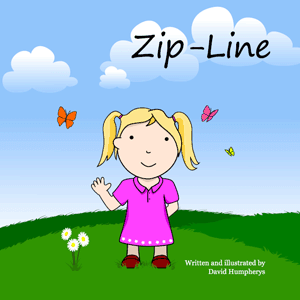 Zip-line is a book for kids that have a scar on their chest from open heart surgery to repair a CHD. Used by families, schools and hospitals, Zip-line whimsically explains the answer to the question "How did that line get there?". The story centers around a little girl and her bunny rabbit explaining to the reader how she got the scar on her chest and how she isn't any different than anyone else. It shows her unrestricted in activities and features age appropriate illustrations - no blood, or anything remotely graphic. It aims to set a model for kids with a CHD to be comfortable with themselves, their heart scar, and the surgery that they were too young to remember. Zip-Line is written by David Humpherys, the father of Ella who was diagnosed in utero with a CHD - Congenital called DORV - Double Outlet Right Ventricle. After birth Ella's diagnoisis was stated as TOF - Tetralogy of Fallot, ASD - Atrial Septal Defect , VSD - Ventricular Septal Defect, & Pulmonary Stenosis, but amazingly her oxygen saturation levels were fine, so heart surgery was delayed until 6 months of age. 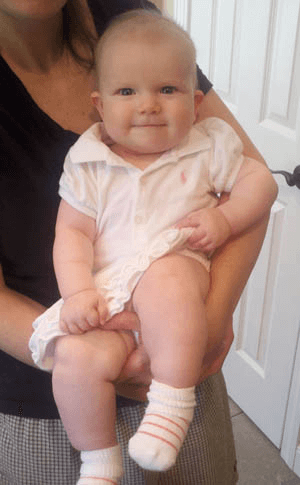 Within days of her six month birthday Ella underwent an 8+ hour surgery to repair her CHD. After 7 days in the CICU, and three more days on the cardiac floor Ella came home healthy and with her "personal work of art". While in the Cardiac Intensive Care Unit at Children's Hospital in Boston, I started scribbling lines for a poem about how she got her heart scar. I wanted to have something to give to her when she got older to explain the larger than life scar that I saw before me. I didn't want her to be self-conscious of her scar. I hoped that she would feel strong because of it, but not have it define who she was. The result is "Zip Line". I hope you and your children enjoy the book. Already have the book? E-mail me or Like Us on Facebook! Ella a few months after surgery in her pink dress.